DOWN THE ROAD: Based on a body-on-frame, the extra power in the overhauled Enclave is plentiful to propel the 4,358-pound plus vehicle. The ride is solidly built for rapid acceleration from any speed, generous passing ability and precise balance/handling. And who can forget Buick’s legendary QuietTuning, which insulates occupants from road and wind noise? TECH & PERFORMANCE: Under the hood resides a sole 3.6-liter V-6 cylinder engine that now cranks out 310 horsepower (increase of 22 hp from its predecessor) @ 6800 rpm and 266 pounds-feet (down by 4) of torque @ 2800 rpm. Power is routed through an immensely impressive 9-speed auto gearbox (forget the previous 6-speed). Available as a front-wheel or all-wheel drive and in an all-new Avenir trim, suspension is driven by an able MacPherson strut front and five-link independent rear. The electric power rack-and-pinion steering is quick, accurate and direct. 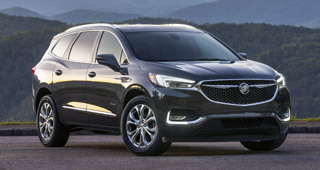 LOOK & FEEL: With a boost in wheelbase up by nearly 2 and length by 2.5 inches, the totally redesigned Enclave shows off a three-dimensional mesh grille and a centered tri-shield emblem with chrome wings. It is surrounded by bi-functional LED projector headlights, daytime running lamps, and standard upper/lower grille shutters. This being a Buick, you are assured of a luxurious and generous cabin. Ice-blue ambient lights highlighting the rounded instrument cluster, and the 8-inch color display atop dashboard for navigation, audio, rearview camera and phone, immediately draw attention. Our chestnut interior with ebony piping on plush leather seats looks elegant and classy. While the second-row Captain’s chairs slide fore and aft, the third-row power seat folds flat effortlessly. With both rear seats folded, you get a notable 97.6 cubic feet of space. There is also a colossal hidden under-floor cargo hold and well-placed bins and cubbies. Other standard goodies include eight-way power driver and six-way front passenger seats, tri-zone auto a/c, hands-free power lift gate, wood-accented power tilt/telescopic steering column, wireless phone charger and a dual moon roof. SAFETY FIRST: Standard features include dual front and side airbags, side curtain airbag, front center side airbag, front/rear park assist, StabiliTrak system with traction control, four-wheel antilock brakes, rearview camera, forward-collision and rear-cross traffic alert, lane keep/departure warning, surround vision, remote keyless entry and tire pressure monitoring system. OUT THE DOOR: $53,415, plus tax, tag, delivery and destination charges. WHY DIG IT: There is ample of room for passengers and cargo as well as commendable tow capacity at 5,000 pounds (up by 500). What’s there not to like? Despite tough competition in the premium crossover SUV segment from Acura, Lexus, and BMW among others, the Enclave should serve the needs of large households quite nicely. 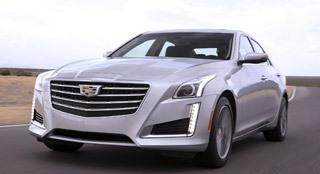 Last year, we had the fortune of driving the Cadillac CTS-V with a 6.2-liter V-8 blasting off 640 horsepower, sprinting from 0 to 60 mph in 3.7 seconds and tops out at 200 mph. For 2018, we received yet another CTS but this one with a 3.6-liter twin-turbo V-6 engine putting out a healthy 420 hp @ 5750 rpm and 430 pounds-feet of torque @ 4500 rpm. Power reaches all the wheels via a 8-speed auto transmission with magnesium paddle shifters. Magnetic Ride Control adjusts the four-wheel independent suspension as per road conditions, resulting in a smooth but firm ride. It also keeps body roll to a minimum. Ensconced on the unitized welded steel body is a sizeable three-bar chrome-surround grille that is flanked by hi-xenon headlights. Climb into the Caddy and your first impression is of a tailored, upscale and luxurious cabin. The well-lit interior is equipped with the hands-on CUE (Cadillac User Experience). An 8-inch touchscreen in the center stack includes capactive controls, haptic feedback, gestures and voice recognition (yes, Apple CarPlay and Android Auto are available). Throw the 12.3-inch reconfigurable instrument cluster into the mix and you have an infotainment system that should be the envy of the competition. The driver and front passenger are coddled by supple and supportive leather bucket seats. In fact, there is plentiful of head and leg room for five adults to relax and sit in comfort. To accommodate drivers of all heights, Cadillac has equipped the CTS with a power tilt/telescopic three-spoke steering wheel. Standard goodies include head-up display, sport alloy pedals, heated/cooled power front seats, tri-zone auto a/c, magnesium paddle shifters, power rear sunshade and wireless phone charging. Standard safety features include dual front and side airbags, side curtain airbag, front knee airbags, four-wheel antilock brakes, stability and traction control, rear and surround vision camera, rear-cross traffic, lane change and side blind zone alerts, forward auto braking, remote start, tire pressure monitor and daytime running lights. OK, so it doesn’t have the vast amount of power as the CTS-V we tested last year but the 2018 CTS lunges forward with an eagerness to tackle any road/weather condition. It is a splendid combination of performance and style that will leave you wanting for more. After the 4C Spider two-seater sports car and the Giulia sedan, Alfa Romeo has introduced the Stelvio SUV to the U.S. The all-new compact luxury ride shares its powertrain with the Giulia: 2.0-liter inline-4 turbocharged engine putting out 280 horsepower @ 5200 rpm and 306 pounds-feet of torque @ 4000 rpm. Mated to an 8-speed auto gearbox, the double-wishbone front and an Alfa-link design rear suspension effectively eliminate sharp bumps on the road and reduce body roll. Providing a positive on-center response is electric steering. The all-wheel-drive Stelvio can tow up to 3,000 pounds and can take off from 0 to 60 mph in 5.4 seconds with top speed of 144 mph. The “dna” modes available stand for dynamic, natural and advanced efficiency. 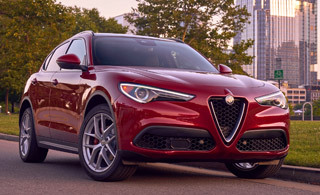 Thumbs up to the exterior styling, which keeps up with the Alfa Romeo tradition of a triangular grille hosting the Italian automaker’s emblem while flanked by horizontal bi-xenon headlights. The functional interior is done nicely with a robust manual tilt/telescopic steering column for a firm grip. Also worth a mention is the 7.7-inch instrument cluster of analog speedometer and tachometer gauges and digital driver information center. Aluminum splashes are sprinkled throughout to lend classiness. The 10-way power front leather seats are not just plush but also comfy. Other niceties include dual auto a/c, steering wheel paddle shifters, power lift gate, 8-speaker sound system, and an optional 8.8-inch nav/audio/phone display ($1,550) as well as the dual-pane sunroof ($1,350). Dual front and side airbags, front knee airbags, four-wheel antilock brakes with stability/traction control, rearview camera and park assist, hill start assist, tire pressure monitor and daytime running lights are standard. Undoubtedly, this all-new vehicle enhances the miniscule Alfa Romeo lineup in the U.S. If in the market for a compact luxury SUV that drives like a car with people-hauling practicality and fuel economy, take the Stelvio for a test-drive. And by the way, its name is derived from the famous Stelvio Pass, the highest paved mountain pass in Italy with 48 hairpin turns. It’s like an all-new Hyundai Elantra for 2018. The compact sedan/hatchback now portrays a lower and wide stance with a cascading hexagonal grille flanked by standard projector headlights and vertical LED daytime running lights. The rear gets a standard spoiler, dual exhaust, and LED tail and brake lamps. Larger than its main competitor, VW Golf, the Elantra goes up 1.6 inches in length and .6 in width from its predecessor. However, the 2.0-liter 4-cylinder engine still develops 161 horsepower @ 6200 rpm and 150 pounds-feet of torque @ 4200 rpm. Power reaches the front wheels via a crisp-shifting 6-speed auto gearbox. By no means is this a speedster but the car handles uneven surfaces with little sacrifice to your back side. The pleasing and functional cabin sports a horizontal dash layout of a standard 8-inch display audio/nav/phone screen, 60/40 rear seat, rearview camera, and Android Auto and Apple CarPlay. Available comforts include a/c, tilt/telescopic steering column, trip computer, power windows and door locks, and rear center armrest. Cargo volume is up by 8 percent, now 55.1 cubic feet. For an optional $4,300, you can get leather seats, panoramic sun roof, heated/cooled front seats, full LED headlights/tails, electric parking brake with auto hold, BlueLink Connected services, wireless phone charging, Infinity audio with 7 speakers, among other goodies. Standard safety features include dual front and side airbags, side curtain airbag, driver knee airbag, four-wheel antilock brakes with electronic brake distribution and brake assist, front/rear crumple zones, electronic stability and traction control, blind spot monitor, front seatbelt pretensioners, remote keyless entry and tire pressure monitoring system. 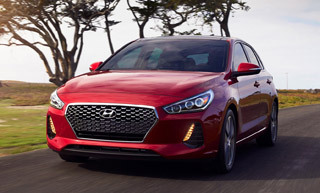 Base-priced at $20,350, the fuel-sipping but agile, fun-to-drive and delightful Elantra is the perfect car for a daily roundabout. Plus, Hyundai’s five-year, 60,000-mile basic, 10-year, 100,000-mile power train warranties should convince you to sign on the dotted line.